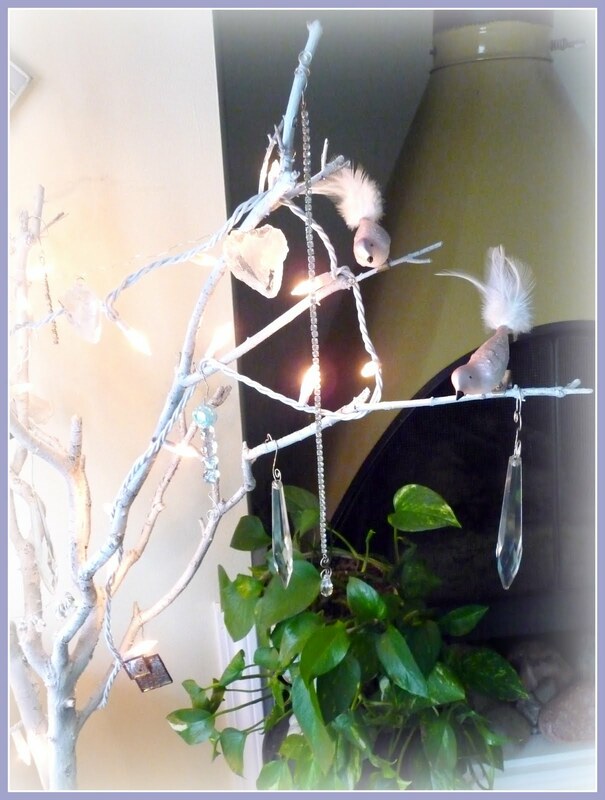 Fibery jewelry with lots of texture and shine, nothing wrong with that! 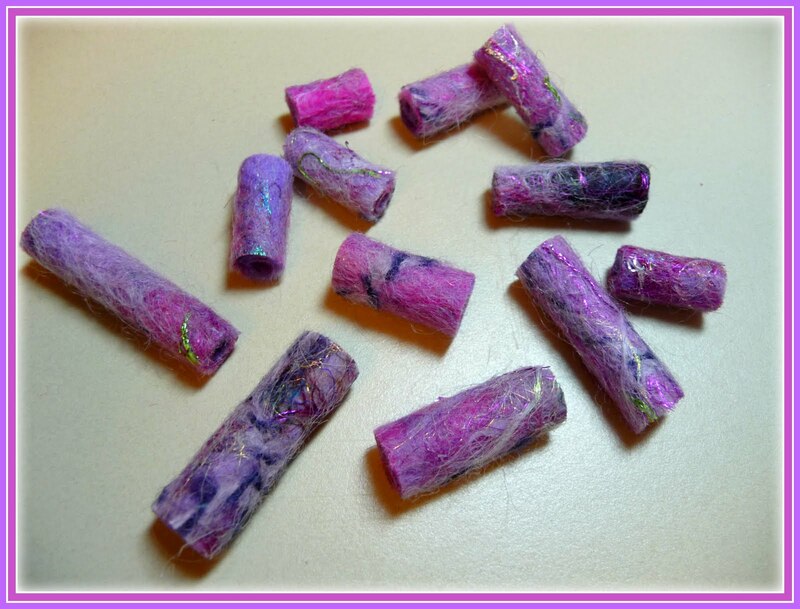 I've created these tubular beads ranging in size from around .5" to 1.5" using the wet felting technique of layering many feather thin wisps of fiber with lots of metallic threads, Angelina fiber, sari silk and other goodies nestled in between. 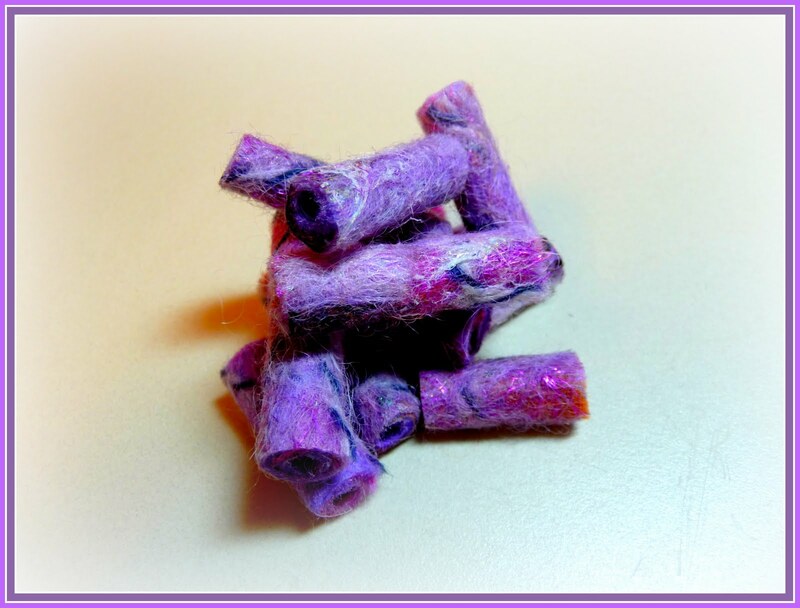 The non felting fibers are trapped between the layers of feltable fiber creating beautiful pops of color and shine. 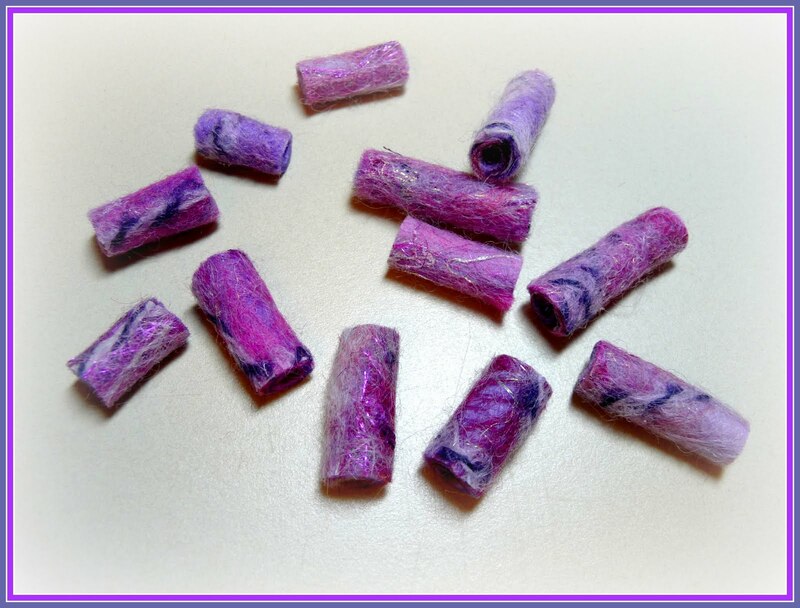 I've made them with a generous 4mm hole for stringing them on hand spun for a funky, artsy flair. They would also be wonderful strung on a short length of fiber/yarn and used as a spin-in, and of course they already have a jewelry like quality and would be perfect for adding some fibery goodness to any jewelry design. These bead sets have already been listed in my Etsy shop, but I know I will making some for myself very soon! Happy New Year, Blessings Friends! 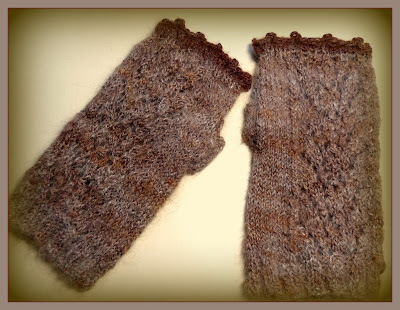 I've really been hankering for some fingerless gloves, my hands get so cold sometimes, I thought they would be nice and cozy for around the house as well as out in the big wide world. I spun up a batch of my PixieDust blend in worsted weight and with 70 yards had exactly enough to finish! I wasn't too worried, I was knitting two at a time on a circular, so I knew if I needed to I could mix in another color of hand spun if I ran low. 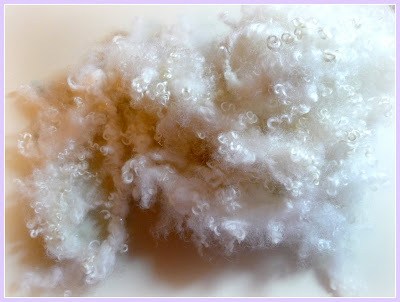 I dyed up this luscious angora fiber in a pretty, soft pink. I'm planning to spin this and crochet a fluffy trim around the cuff. It's on the roster as soon as I finish a couple of secret projects. Wishing you all the best of the season and on into the New Year! Blessings Friends! It's been a crazy busy week, normal for this time of year, it will settle down soon enough. 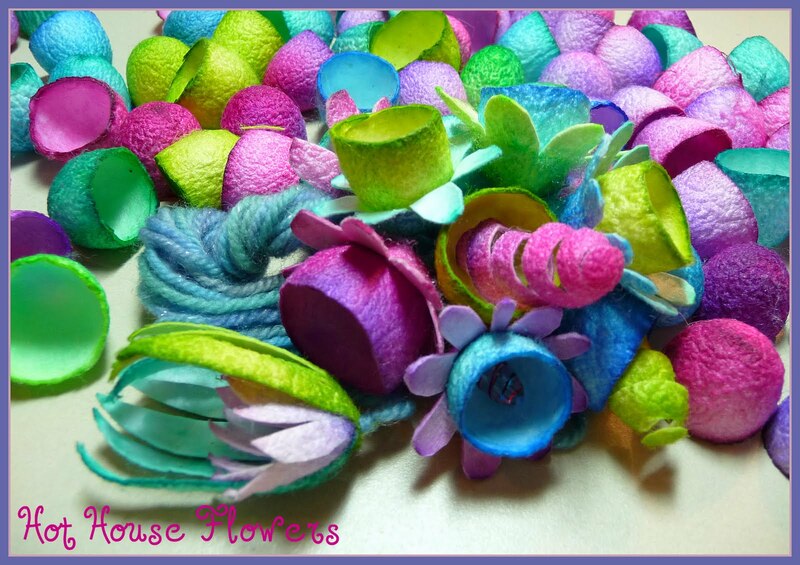 It's been especially productive on the fiber front and I have added lots of goodies to the shop! Here's a tiny sampling. I am now carrying one of my favorite all time spinning add-ins, Angelina! I have a few colors with plans to add more! Ooo, Ahhh, Sparkle! 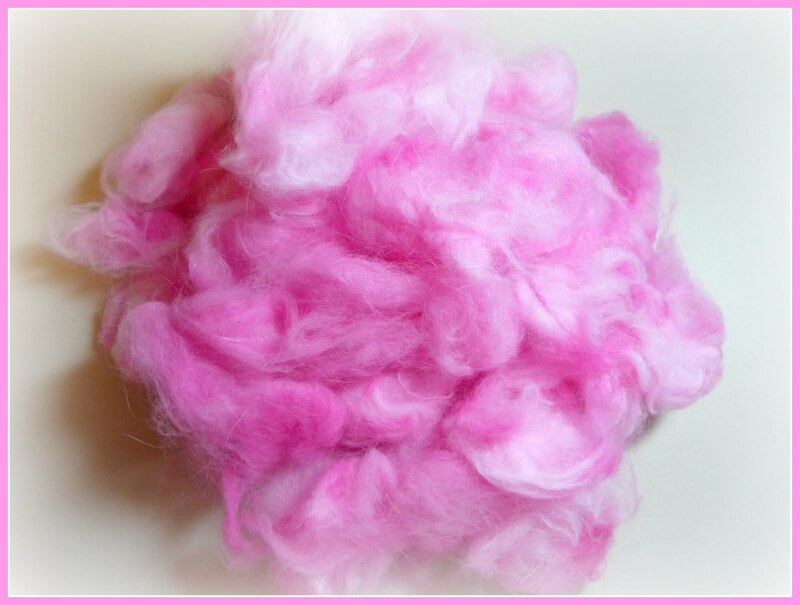 I've added a few new items to the Spinners Candy section of the shop, new fiber palettes and art batts, lots of color and texture for spinning play! 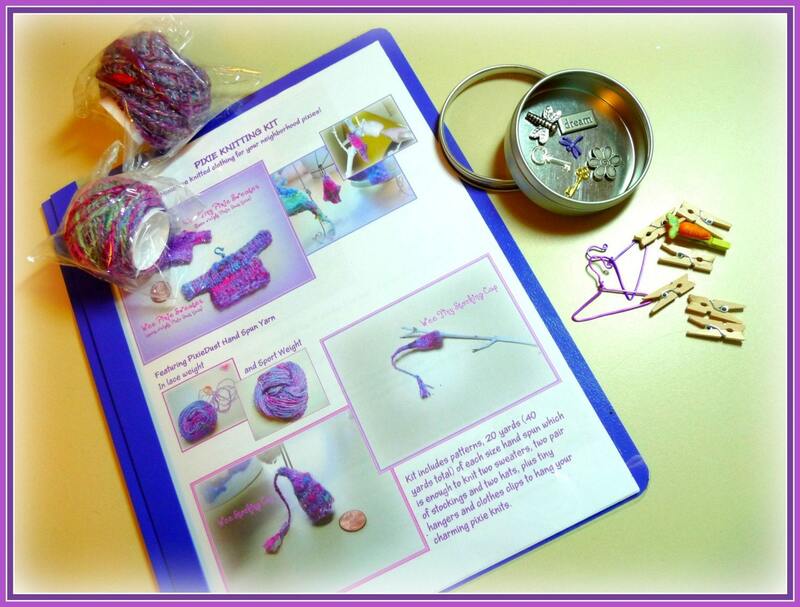 I've put together a kit for those who want to do some pixie knitting of their own, it includes patterns for stockings hats and sweaters perfect for the wee folk in your neck of the woods. 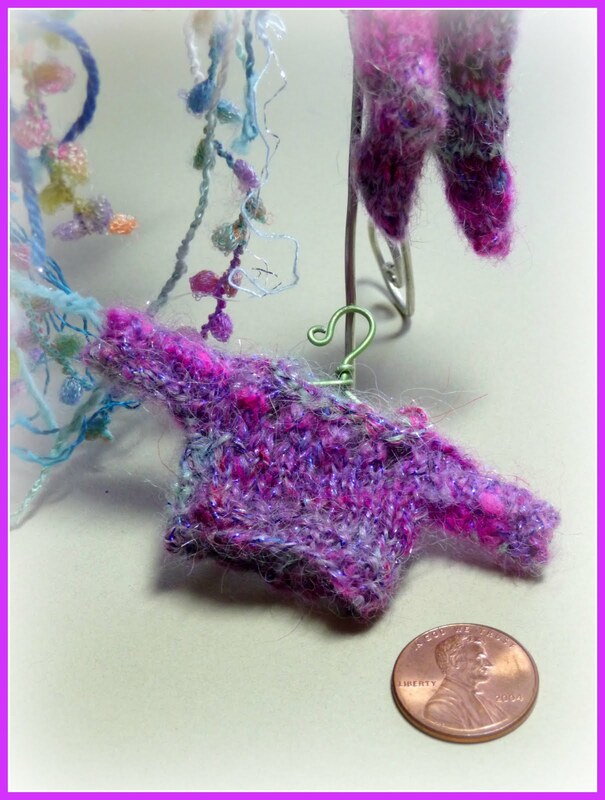 I've also included two balls of my PixieDust hand spun, one in lace weight and one in sport weight, the kit contains enough yarn for two sets of each pattern, plus tiny colorful hangers and diminutive little clothes pins, perfect for hanging your pixie knits. The hangers and clothes pins come in an artsy little keepsake tin. 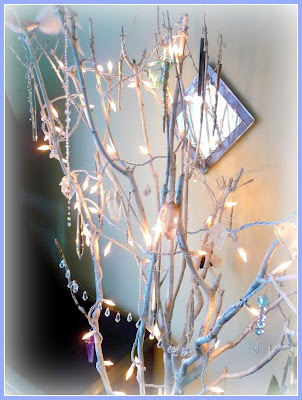 Take a moment in this hectic holiday season to put your feet up,kick back and take a peek around the shop, I've created a coupon for my blog readers giving you 20% off, good for purchases through the rest of the month. First add an item(s) from my shop, to your cart and when you’re finished shopping,start the check out process. Enter the code, CURLYBIRDEXPD2010 in the ‘notes to seller' and the email address where the revised invoice should be sent. Complete the order but do NOT go to Paypal to pay. You will receive a revised invoice, and a link to complete payment, via email reflecting the discount. Hello Fiber lovers! 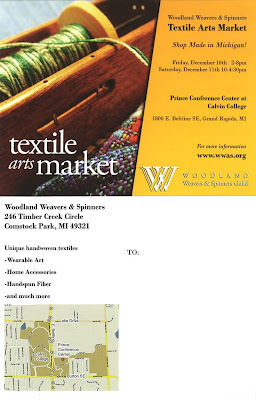 If you're local and want the opportunity to shop the wares of tons of talented fiber artists, stop by and visit us at the Prince Conference Center. I was helping set up earlier and there are so many beautiful items! It's been a really creative week, I've been doing so much spinning and knitting, plus lots of other fiber related activities, which I always enjoy. 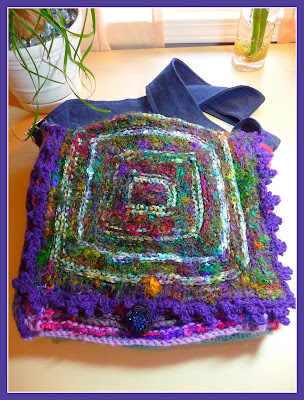 On my list of things I wanted to get done were some scarves knitted with my hand spun art yarn. 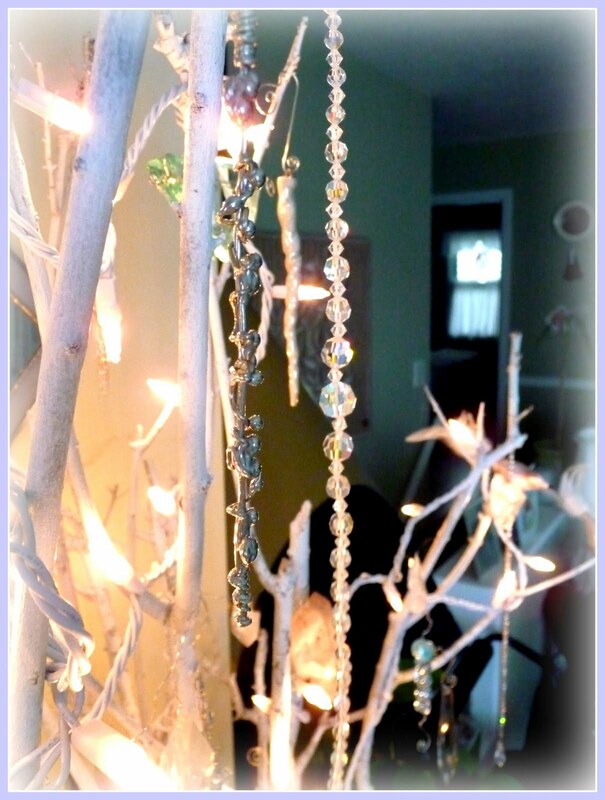 Those delicious thick yarns can really sparkle up a simple scarf. It all started with this batt I blended up, Winter Wonder. Chuck full of super soft, creamy white and silver fibers, like angora, alpaca, mohair, wool, milk protein fiber and lamb locks. Providing tons of softness and sheen. 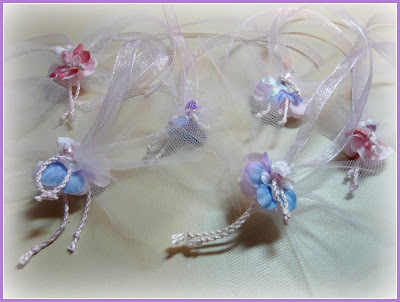 For little wisps of color I added soft tones of my hand dyed, in blues, pinks and lilac. 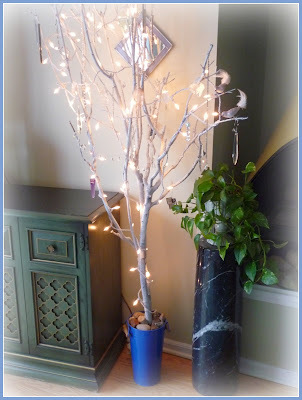 I also sprinkled in short lengths of some of my favorite novelty yarns, like Crystal Palace Stardust and Splash, they really gave the spin that jack frost touch. You can see the silvery splash dancing across the batt, looking very much like frost on a window pane. Plus shimmery Angelina for extra sparkle, like sunlight on an icicle. I ended up spinning and plying four strands of wintery art yarn and plying them together with another Crystal Palace yarn, a super soft pure, beautiful white pom yarn, which I over wrapped with various styles of silver thread. Above is a close up of the yarn. 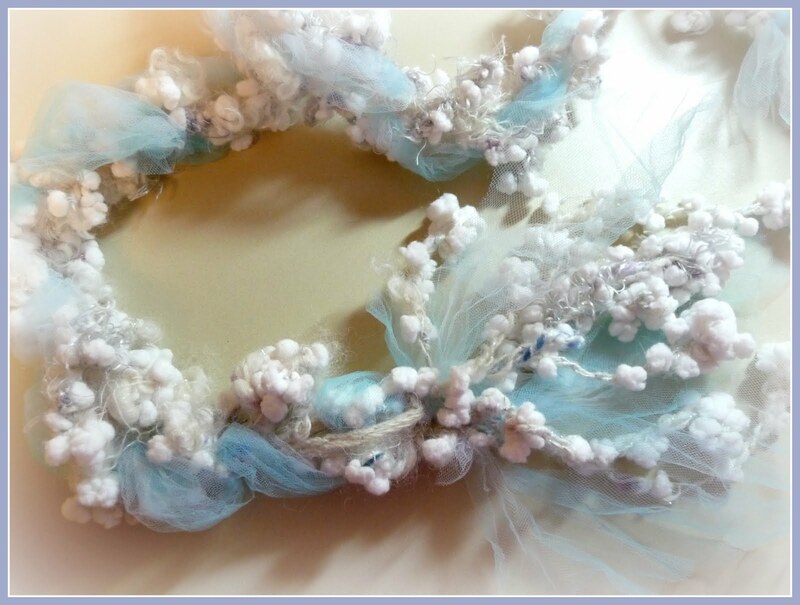 I added Winter Wonder fringe to the ends and included some more tulle, I really like the effect. You can sort of see in this close up, the Winter Wonder fringe is knotted on the ends, creating these chunky little snowballs. It reminds me of the little balls of snow and ice that clung to my wool mittens as a child.Remember how your mitts would just be caked with little snow balls when you finally dragged yourself in from playing in the snow? What I find interesting about this scarf is that while it has these little whimsical touches, it is also artsy and beautiful. As always, I really enjoyed the creative process, it's cool how sometimes things work out better than you could have imagined or visualized at the start. I hope you are all enjoying the fresh start to the new month and the fresh layer of the first snow (first for us) crisp and clean as we wind down this last month of the year and gear up for the new year to come. Blessings Friends! I know, it sounds kind of strange, right? Referring to my House Tree, so let me explain. On the left is another of my wire icicles and one of my most favorite is on the right, a stunning aurora borealis necklace, more of Mum's bling from glamorous days of yore! If you would like to make your own quartz crystal garland/ornaments, it's simple. 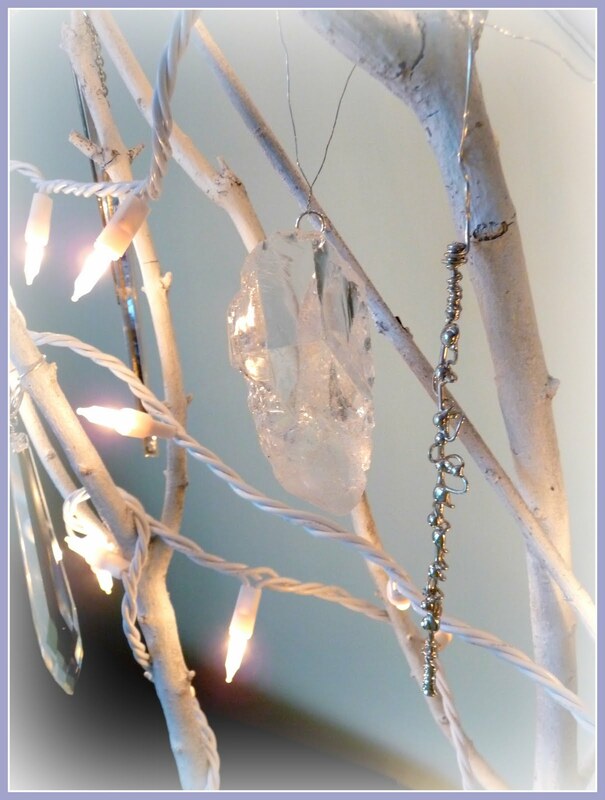 I just used E6000, my favorite go to adhesive for jewelry design, to attach little silver rings to the crystals. Once dry, they're ready to hang individually or as I have, as a garland. Have a wonderful, sparkling weekend! Blessings Friends! It's been a busy fiber week, lots of projects and experimentation. I did an extreme tail spin yarn with some of my baby lamb locks, it turned out soft and fluffy. I have two long strands which I ended up spinning and plying on my spindle, it was just too chubby to fit through the orifice on my wheel, even the jumbo orifice on the plying flier! 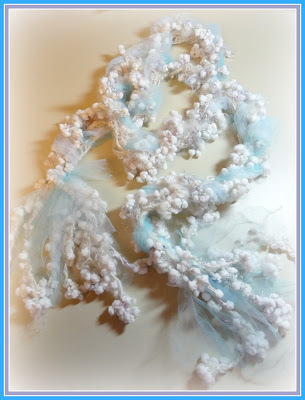 I love how this spun up and I have been swaddling fluffy curly lengths of it round my neck as a scarf, it's so cozy warm and luxurious feeling! Next up, some more tail spinning, I've done another PixieDust blend, and this time I spun in some of the lamb locks dyed in soft gorgeous shades of pink! (my favorite color) I'm tempted to keep this for myself, but it is destined for the shop. I know I'll be whipping up some more of this yarn, it was super fun to spin. I started knitting this scribble scarf yesterday, using some of my hand spun coils and my gumball yarn. It knits up really fast, I'm using some of the pink mohair I received a while back from katie7, in the shawl exchange group on Ravelry, it's a perfect base yarn for this project! 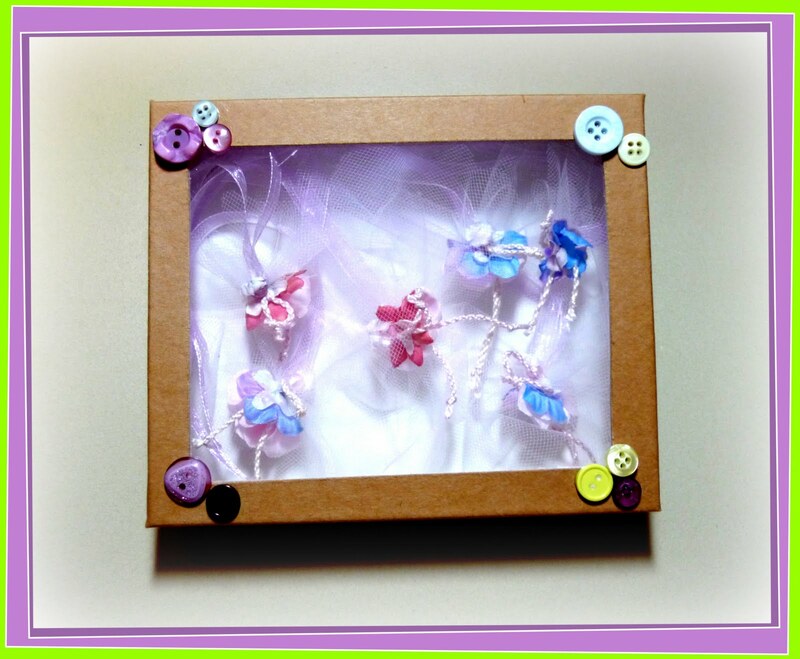 Also on the to do list for this week was to make up little window boxes for the spin-ins I have listed in the shop. I'm loving how they turned out and they will keep the spin-ins tidy and safe until they reach their new homes. 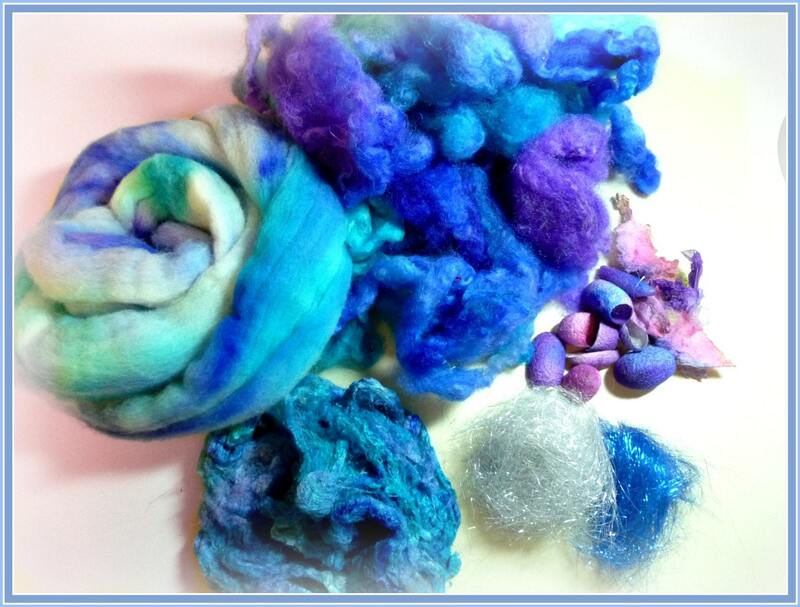 I've been having so much fiber fun lately, dyeing, spinning and felting. Yesterday was another big dye-fest, once I get started, I want to keep going. Next thing you know the drying racks are chuck-full and am forced to pause long enough to let the fiber dry. Which gave me a good opportunity to update my spinning/dyeing journal. 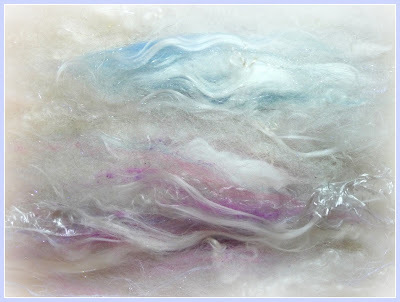 I keep track of my dye recipes and color blends along with spin combinations and new types of fiber I've spun. For each new submission to my journal, I sew in swatches so that I have a nice little visual reminder. Once I got the journal caught up with my latest dye blends, I decided to try some more wet felting. I've had this idea for a long skinny scarf floating around in my noggin and thought I'd give it a go last night. 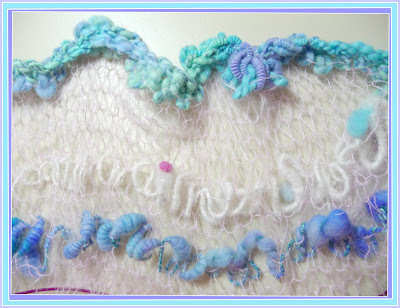 I used merino, alpaca, silk, mohair, finn/merino, wenslydale lamb locks and of course some sparkle. 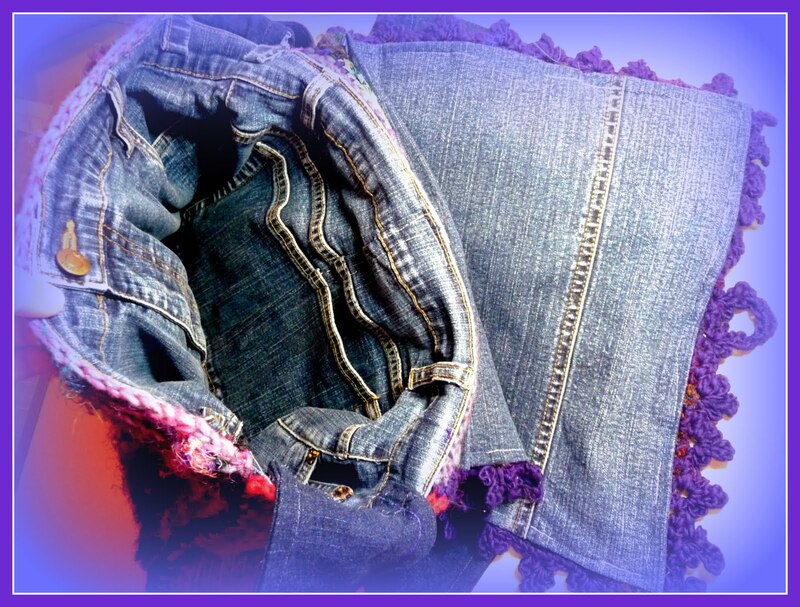 I positioned some of the locks so that they came off the edges of the scarf. It ended up working out nicely, with cute little curly locks popping off everywhere. I love how the silk strands formed beautiful shimmering streams on the topography of the scarf. There is a nice soft hand to the fabric too, with a very inviting textural surface imparted by all the various fibers I used. The other project I wet felted used mostly merino and had a much smoother surface, I liked that look too. 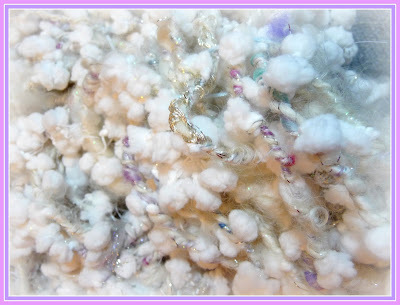 But the softness created by this blend is perfect for a scarf. I think I will embellish it further by using some silver floss to stitch patterns onto the surface. These felted beads are what I like to call a happy accident. I tried one of those short cut methods I read about for scouring fiber...I should know better by now. Some things just can't be rushed. It really ended up taking longer using the "short cut" method! Plus some of my alpaca started to tangle and felt. I was able to gently separate/open up most of the tangled fiber. 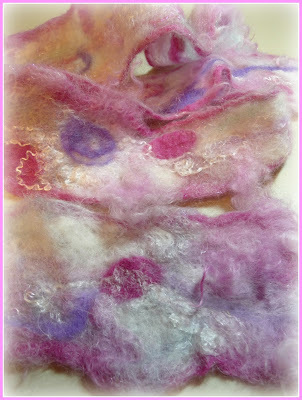 Some of it, the messiest, I decided to use either for wet felting or felted beads. You can see I went for the beads. 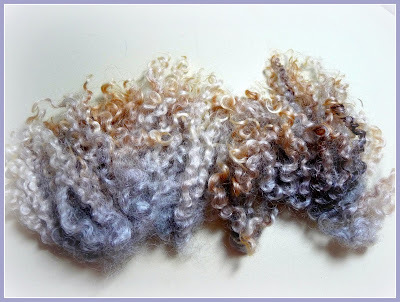 I dyed the tangled locks, originally white fiber from Birch at Lonesome Oak Alpacas, adding all my favorite color combinations. Alpaca dyes up so beautifully. 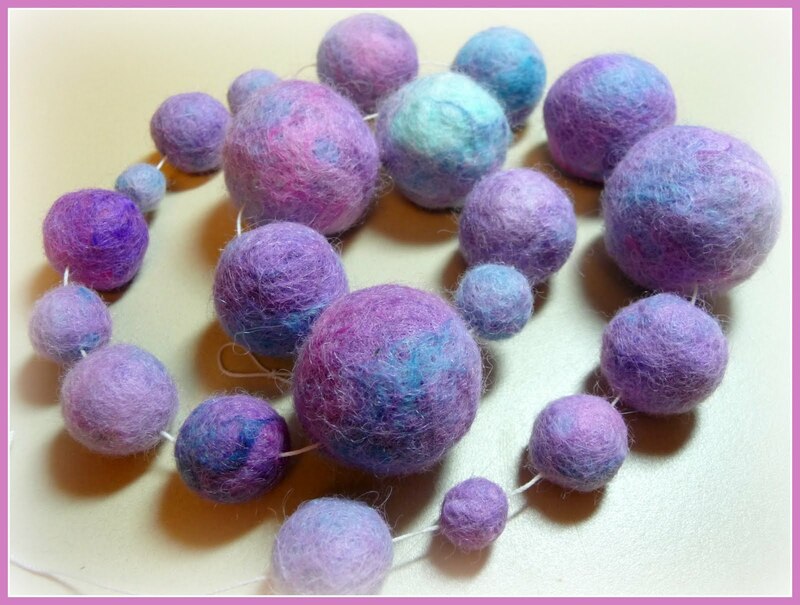 I love felting beads, it's so addictive. By the time I forced myself to walk away, my hands were shriveled prunes! 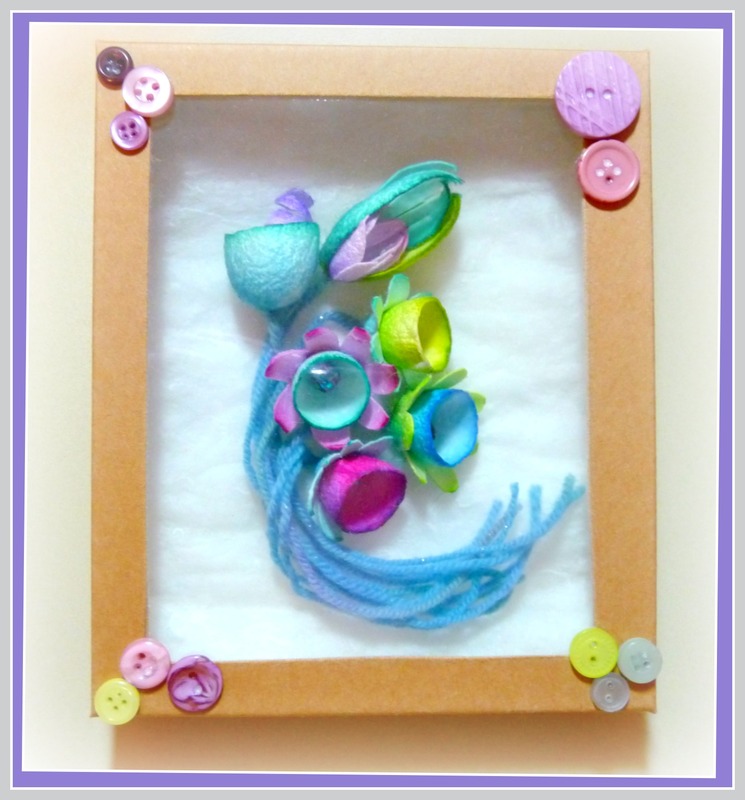 I enjoyed it so much that when the tangled locks were used up, I started looking for more fiber to felt. That's when I said to myself, OK Miss, that's enough, walk away! The largest beads are about the size of a ping pong ball, the smallest about the size of a pea. 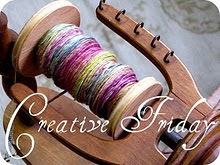 I hope you are all spinning and knitting up a storm too, it's good weather for it as the temperature begins to drop. Have a terrific weekend! Blessings Friends! Hi folks, it's been a crazy busy week! With tons of fiber happenings and lots of other stuff going on too. I guess the big news is that I finally got around to opening an Etsy shop! I've been meaning to do this for some time now, and with our guilds Textile Art Market coming up, I wanted to have the shop set up so that I could include it in the contact information on my product. The shop is mainly geared toward fiber arts, but I will be adding some other little non fiber gift items in the future. 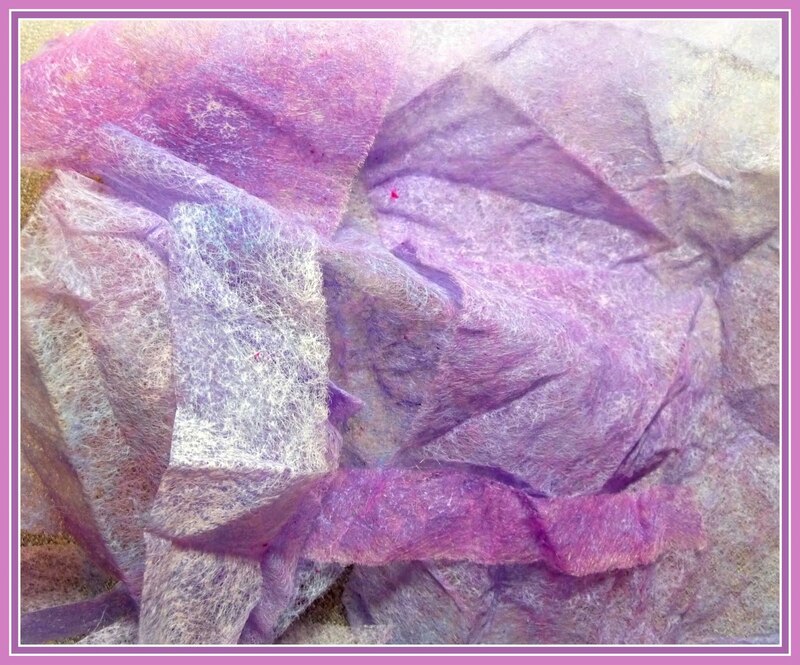 For the moment I have just a few goodies listed but that will be changing soon, as I have dyed up some fibery goodness which I plan on listing early next week. Here's a sample of the goodies. 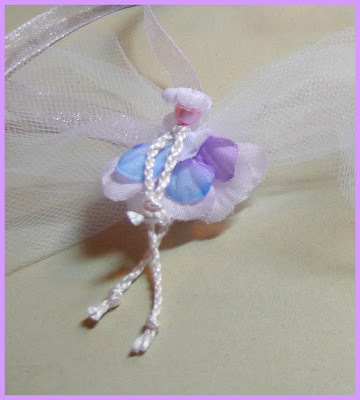 These charming little Dancing Flower Faeries fall into a category I'm calling Spinners Candy. 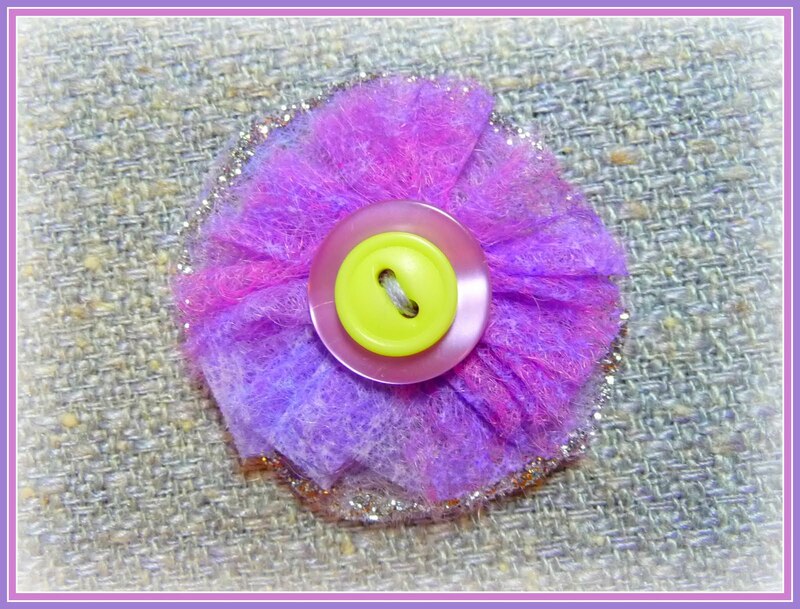 Each one of these cuties was painstakingly hand stitched for quality and durability. I wanted to be sure that they were spin friendly and water friendly. These will make a great spin-in or tie on for your handspun. 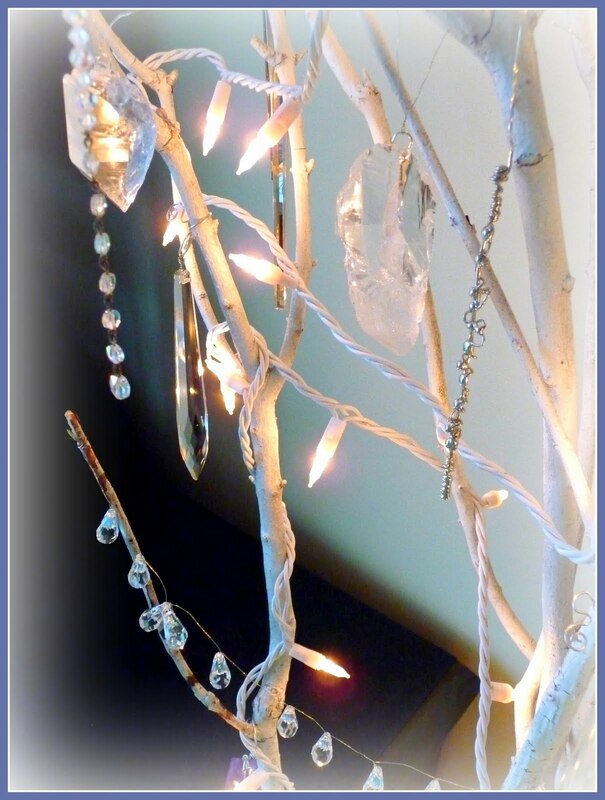 They would also be lovely hung as a decoration for those places around the house which are calling for a little faerie magic. Also a spin-in/tie on, these HotHouse Flowers are made from silk cocoons. I hand painted each little piece and fashioned them into fun, bright, flowers. 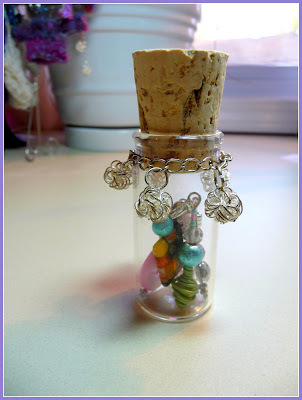 Under the Knitters Candy category I have these pretty little stitch markers in a cute little decorative bottle with a cork stopper. I originally came up with little sets like this to give as gifts to my friends, and have been thinking that others may like them as well. The set includes 6 stitch markers made with gorgeously colored glass, crystal, metallic and semi-precious beads. The markers feature a trigger clasp so that you can easily move or remove your marker while you're working. Rather than having to knit around to it like the fixed ring markers. So, that's a little peek at some of what I've been up to this week. If you are interested you can visit my Etsy shop here; TwirlyCurlyBird plus if you're local you may be interested in the Textile Art Market coming up in December. Happy Halloween! Have a great weekend. Blessings Friends! I decided to do a little pixie-knittin' this week. It's getting colder around here, I thought the wee folk could use some fresh warm clothes. I looked through my stash for the skinniest yarns I could find and they were all too big for my purpose. 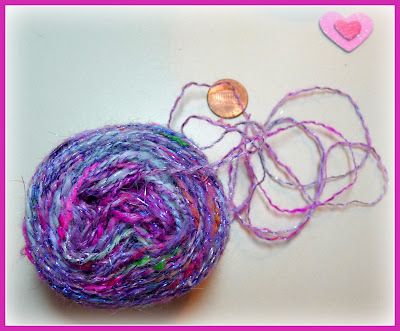 Then I remembered that I was a spinner and I can make any size yarn I need, silly me! So I gathered a glorious collection of colors, fibers and sparkly za-za-zing and spun this gossamer strand of pure happiness. I'm calling it Pixie Dust. 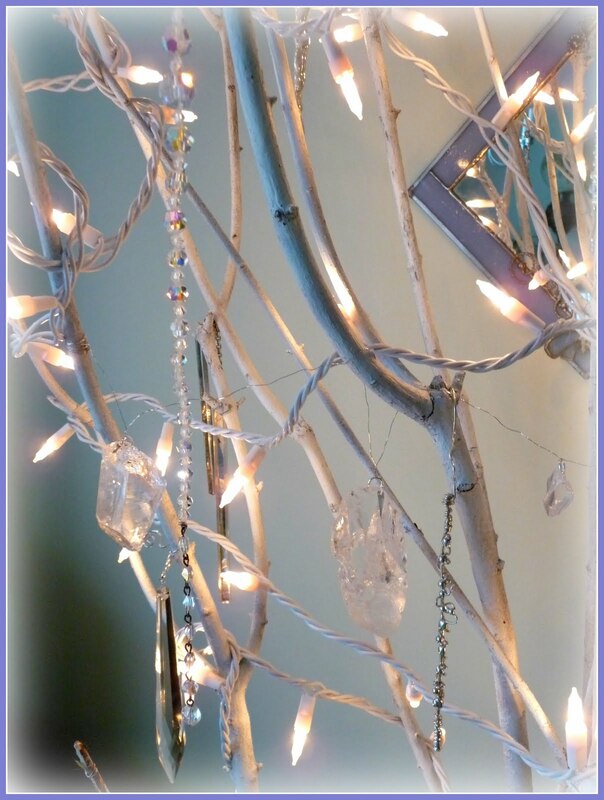 I think the faeries will love it. While I was waiting for the yarn to dry, I whipped up a little acorn bag from some of my other hand dyed spinnings. Finally the yarn was dry and I was able to work up a pattern for this petite pair of stockings. My eyes are very happy, boy do I love color! Next came a wee little sweater. This is a new pattern too, I couldn't locate the one I made up last year. Now that I've written another, it will turn up. This sweater, knitted up in my Pixie Dust yarn is so tiny, it makes the other sweaters look like they're monster size! I have some more knitting to do for the faeries, more hats, scarves, socks and sweaters are in the works. 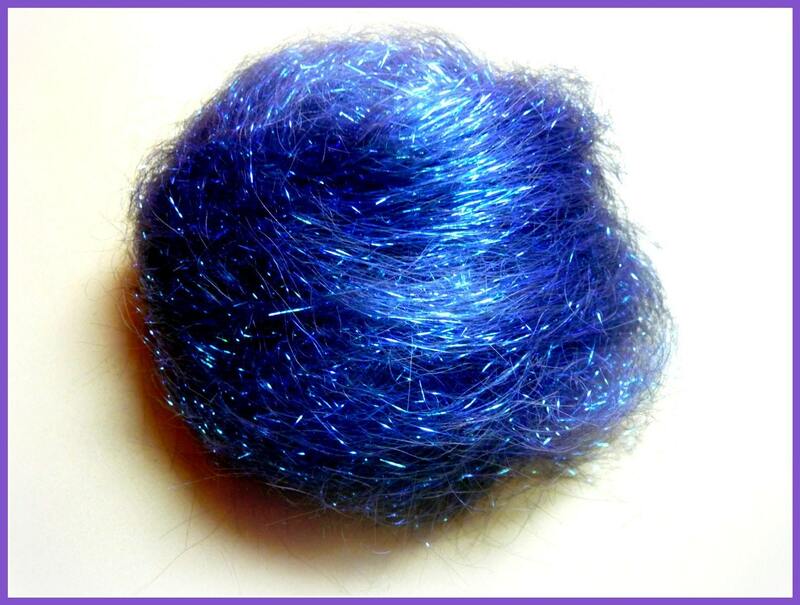 I've spun up some more Pixie Dust in a slightly bigger yarn, I can't wait to start knitting with that. I may have to spin a sock weight Pixie Dust and make some stockings for myself. This kind of fun should really be illegal, I'm a total yarn geek people! Clap if you believe! I hope you have the best weekend ever! Blessings friends! Yea, another finished object to cross off my list of lingering projects. 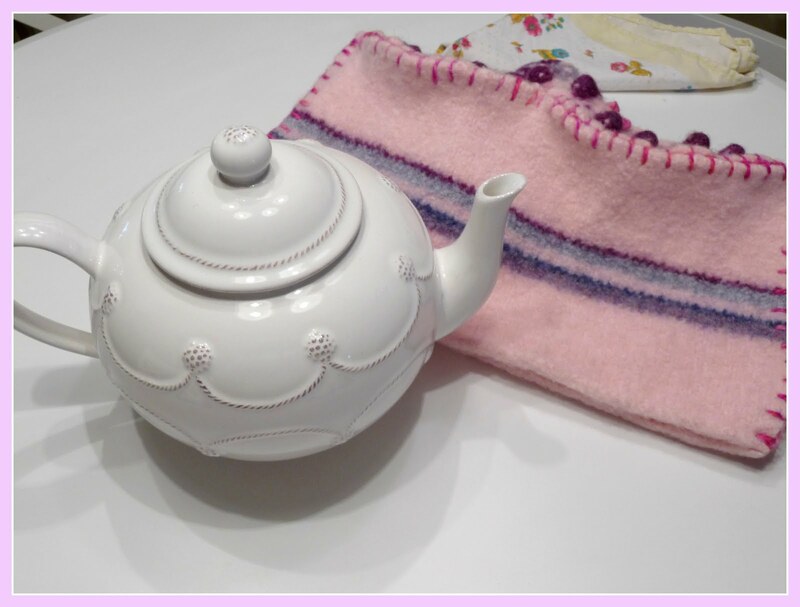 I started this tea cozy over two years ago...maybe longer. I can't really remember why I set it aside, but it ended up in my spinning room up on top of a tall cupboard, I kind of forgot about it, until those times I used my giant tea pot, then I'd think, hey I should finish that cozy. I was forced to squeeze my existing cozy over the tea pot, which made it look like I had a little pig hidden underneath there, cute but a little snug. It didn't take too long to complete, I was almost finished knitting it when it got put up. I fulled it, decided I didn't love the original idea I'd had, then I cut it up and refashioned it into this design. My original plan was to embroider berries and vines around the body in the upper solid border to match the Juliska, Berry and Vine pattern of the tea pot. I've mulled it over for about three weeks now, and decided not to add any embroidery. It's done, and it works quite nicely, it keeps the tea nice and hot while it's steeping and it's my favorite color, pink! I have been fooling around with felting for awhile now, mostly regular old ordinary, knit it big, felt it till it's small. 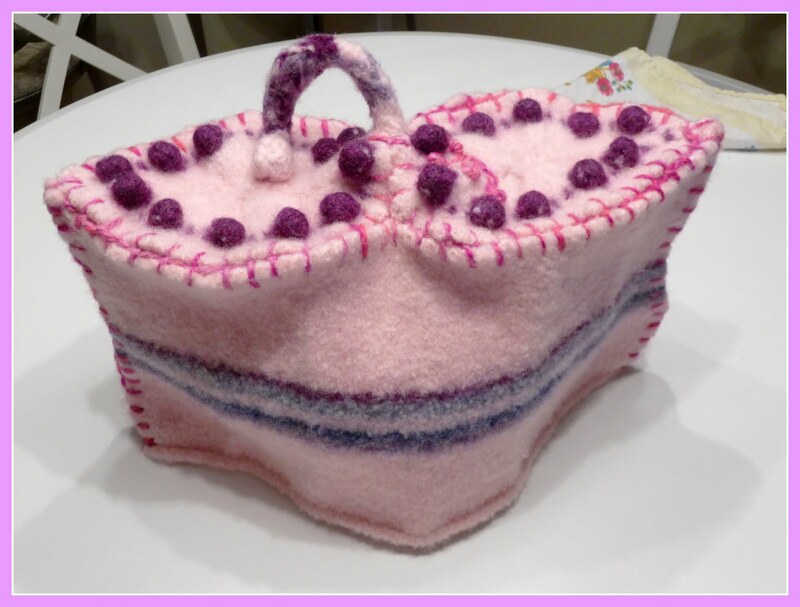 I've seen so many beautiful felted projects using both the nuno and wet felting techniques, I was excited to dive in! 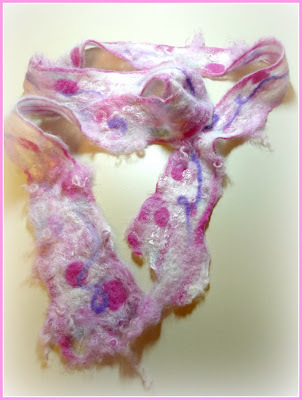 I first tried nuno felting...while both attempts did not work out how I envisioned, (in other words, the way it was suppose to) I absolutely loved the resulting felted noodles and wild fabric. 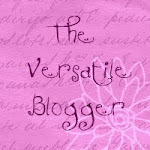 I'm definitely percolating away, thinking up a project for them. In the mean time I saw some really great tutorials and I was able to see all the steps I needed to be successful in this project. I can see now that earlier tutorials I peeked in on were not as thorough in showing all the steps and tips. If you would like to check out the tutorials, you'll find them here at Felting Lessons. You wont be disappointed! 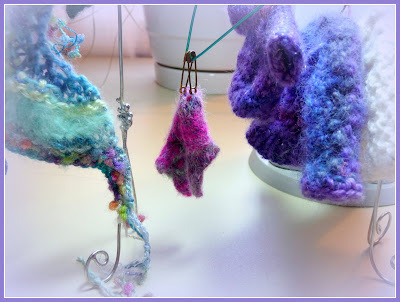 I really, really want to get busy on the nuno felting, but I need to get some silk chiffon, the silk scarves I have are not quite gauzy enough. In the mean time, I played with wet felting. I just did a small test swatch to begin with, it started out 12x20 and felted down to about 6x16. Of course I wanted to make something with it right away! 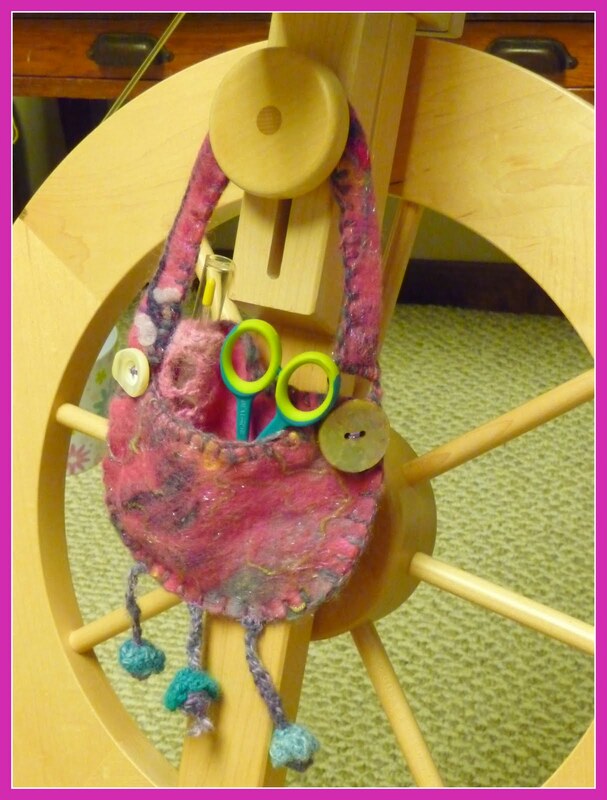 I put together this new ditty bag to hang on my wheel. 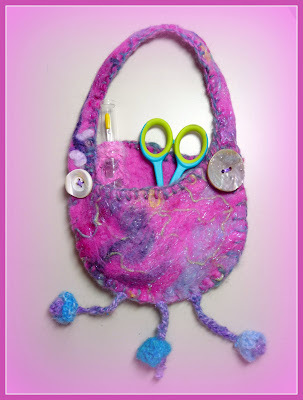 I recycled the little crocheted pouch that holds the oil for my wheel and the crocheted posies too. I stitched the pouch in, tucked over to one side to keep the oil securely in an upright position, and you can see that I attached the posies to the bottom of the ditty bag. 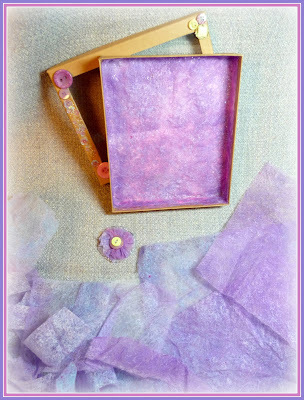 I was pleased I was able to find a way to incorporate the old oil pouch. I crocheted it using some of my very first hand dyed, hand spun yarn. Of course I had to add some vintage mother of pearl buttons from the old button box! 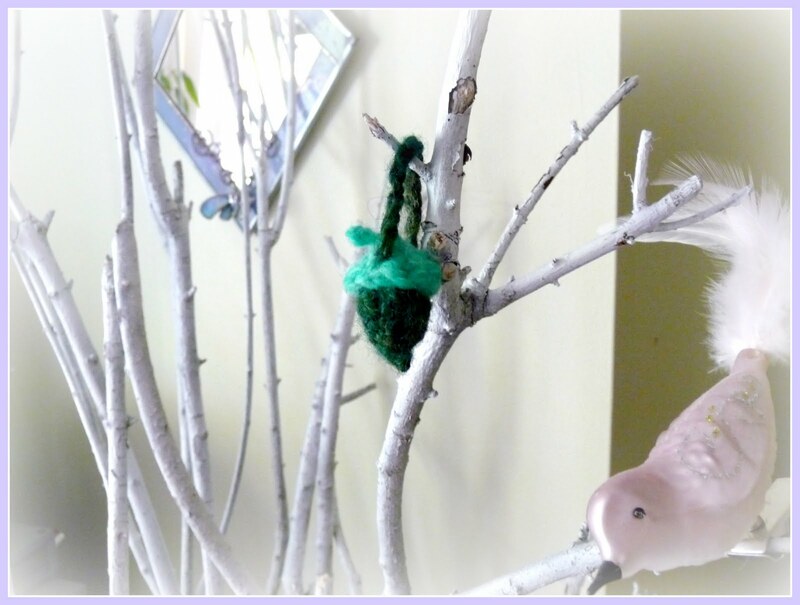 All and all I'm pleased with my first attempt at wet felting, those tutorials made all the difference. I have a lot of ideas for this medium and I can hardly wait to get rolling on them! If only there were more hours in the day! 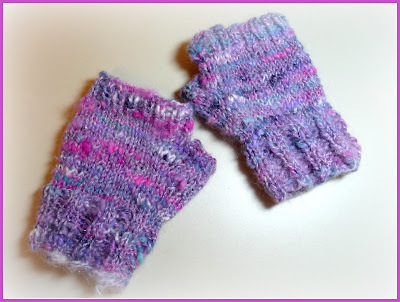 I took a little break this week from my UFO round up to spin and knit these cozy wristlets. 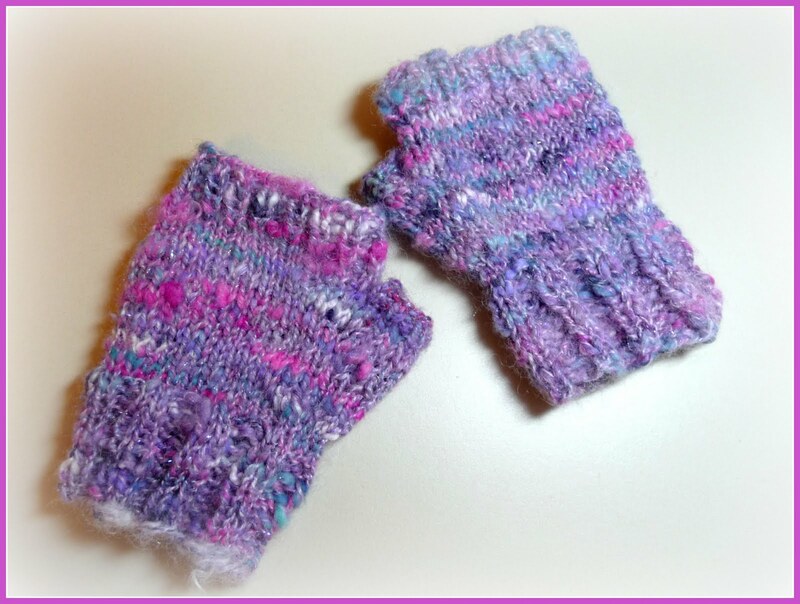 The pattern is from knitty, check it out here if you're interested, the pattern is for socks and wristlets. It's a quick easy pattern, great for gift knitting. I was concerned that I might not have enough fiber to knit them as long as the pattern suggested, so I knit them both at the same time using the magic loop technique. I started with 1.25 ounces of raw fiber from my friend Tamara at Via Verde Farm, which spun into close to 300 yards of two ply lace weight. The fiber came from her beautiful little cria, Delphine. I did end up shortening the length slightly from 7.5 to 6.5, then I switched to a darker brown for the ribbing and crocheted a petite picot edge to finish. 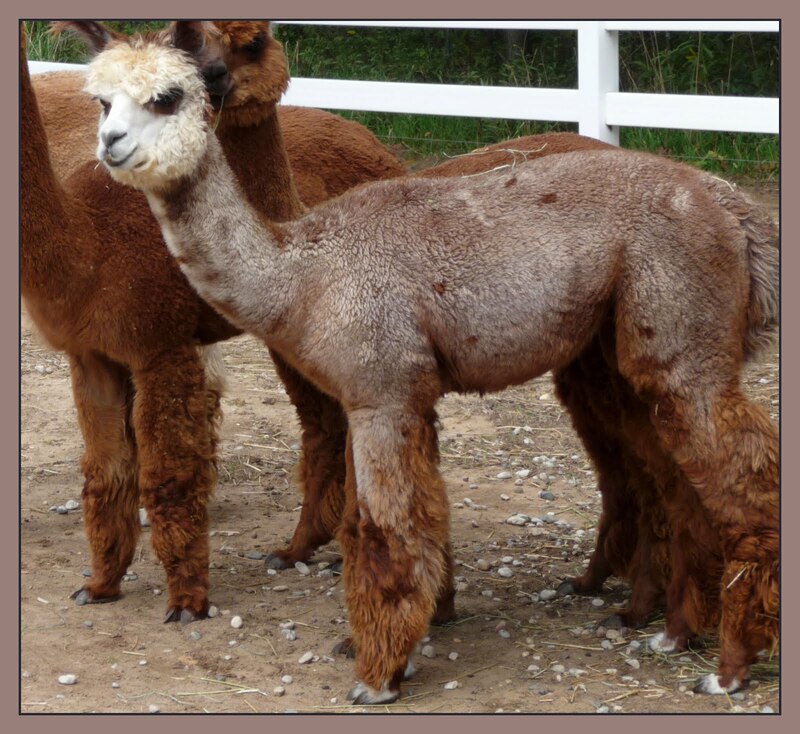 The dark alpaca I used is also from Via Verde. 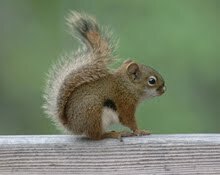 Here's the little cutie that provided the lovely fiber, look at that sweet face! 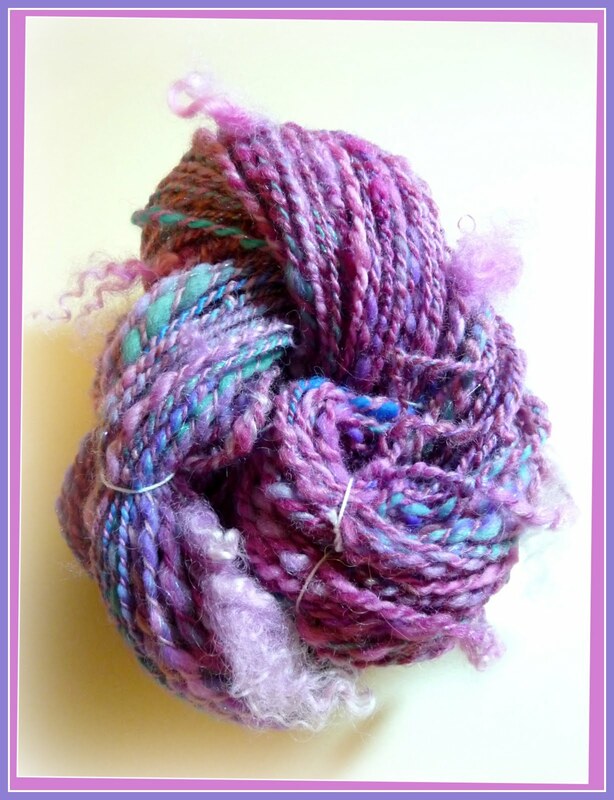 It spun up into a nice lace weight two ply, just spinning from the washed locks. Such soft cozy fiber and it has a beautiful halo too. By spinning it from the lock I was able to maintain the natural variation of color in this little guys fleece. I was pleased with how they knitted up and I happily presented them to Tamara so she could have a little keepsake from Delphine's first shearing.